Justice Babatunde Quadri of the Federal High Court in Abuja, on Monday, withdrew from the suit seeking to sack Governor Kayode Fayemi of Ekiti State from office on the premise that he was not eligible to participate in the July 14 governorship election. The suit marked FHC/ABJ/CS/663/18, was lodged before the court by a Chieftain of the All Progressive Congress, APC, and former governor of the state, Mr. Segun Oni. Oni who came second in APC’s governorship primary election in Ekiti state, is contending that Fayemi was not legally qualified to take part in the contest having failed to firstly resign his position in President Muhammadu Buhari’s cabinet. It will be recalled that Fayemi won the party’s primary poll on May 12, at a time he still held sway as the Minister of Mines and Steel Development. Fayemi officially resigned the position on May 30, about 18 days after he clinched the APC governorship ticket with a total of 941 votes as against 481 votes that was polled by his closest rivalry, Oni. 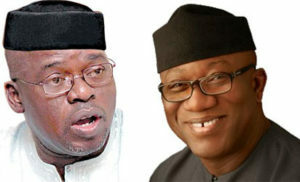 Meanwhile, in the suit he lodged shortly after the primary, Oni argued that Fayemi ought to have relinquished his Ministerial position, at least 30 days to the primary poll. Aside Fayemi and APC, the Independent National Electoral Commission, INEC, was equally joined as a Defendants in the suit. Meanwhile, when the suit came up for hearing on Monday, Justice Quadri, said he was not disposed to continue the matter. He said the Chief Judge had granted permission for the case-file to be transferred to Ado-Ekiti for adjudication. Specifically, Oni had through his lawyer, Mr. Anthony Adeniyi, prayed the court to determine, “Whether by virtue of All Progressives Congress constitution and particularly Articles 2 and 5 of All Progressive Congress 2014 Guidelines for the nomination of candidates for public office as applicable to the A.P.C Governorship primaries conducted on the 12th May, 2018, the 1st Defendant being a serving member of the Federal Executive and Federal Minister of Solid Minerals, Mines and Steel Development having not resigned his appointment as a member of Federal Executive and Minister of Solid Mineral, Mines and Steel Development, at all or at least 30 days to the said primaries election of 12th May, 2018 was qualified to contest and participate in the said All Progressive Congress Governorship primaries of 12th May, 2018 as an aspirant in that election”.